I often get asked this very question. 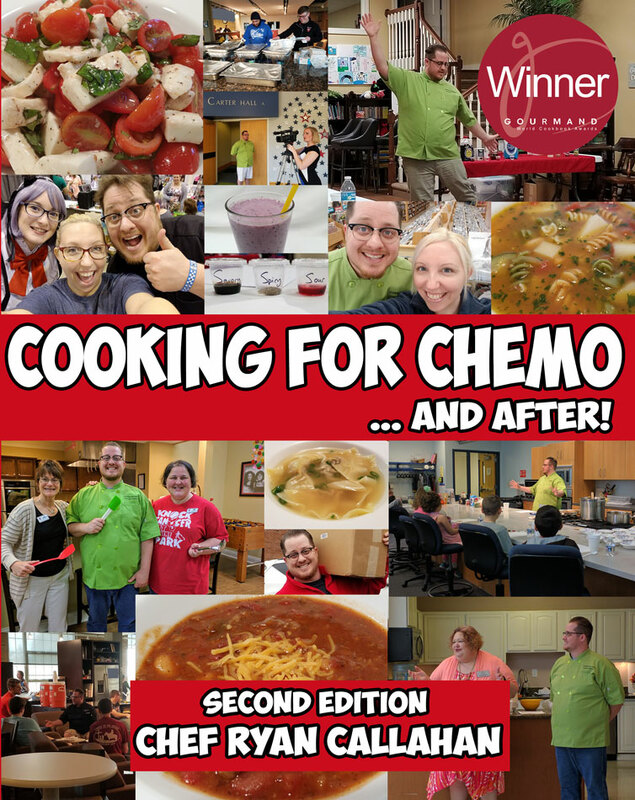 Chef Ryan, “How do I cook for my friend that has cancer? And what do I cook for them?” Cancer treatments don’t just affect the people going through the treatments. A cancer diagnosis affects the family and friends of the person going through them as well. These friends very often want to step up and help their loved one get through such a hard time in their life. Most of the time, this type of support is received in the form of food donations to their loved one with cancer. And while these food donations are very much needed and incredibly helpful, there are a few things to take into consideration before baking your family member or friend a casserole. Ask your friend with cancer these question BEFORE you start cooking for them. 1) Find out what foods they ARE craving. Ask your friend with cancer, are there any foods or specific flavors that are easier for you to eat or are there any foods that you get really excited about? Cravings are a great thing! They are your body telling your brain how to vocalize the nutrients that your body is lacking. This expresses itself in many different forms from desiring big juicy cheeseburgers to baked beans to chocolate all the way to pickles. By embracing these cravings and catering to our loved ones preferences, we can help to ensure that they will get the nutrients that they need into them during cancer treatment. Remember that everybody is different and each craving will be different. Also keep in mind that you are more likely to eat what you like then eat what you don’t like. 2) Find out what foods or smells are making them sick. Ask your friend with cancer, are there any smells or specific foods that have been making you nauseous? Nothing will turn a person off faster than foods that smell bad to them. An offensive smelling food will dry up someone’s appetite faster than water in the desert. These offensive smells are known as pungent smells and we want to do our best to avoid them. If that is not possible, then we need to mask their smell. Broccoli is a major offender in the war against pungency. It is an incredibly healthy choice but often times its incorporation into a dish will make your loved one instantly nauseous from its pungent smell. If pungent smells can not be completely avoided, they can be tempered with fragrant herbs and spices as well as incorporating 1 tablespoon of red wine vinegar followed by 1 tablespoon of sugar and cooked into the dish. The vinegar will neutralize the scent and the sugar will cover the taste and smell of the vinegar but still leave its special effects. 3) Remember to take the weight of the food into consideration. Ask your loved one, what types of foods they have been having the most success with? 4) Make sure to make food that is easily re-heated and easy to store. One of the best things you can do is to bring over pre-cooked and pre-portioned meals that can either be frozen or refrigerated and reheated quickly in the microwave or oven. The reason we take this into consideration is that cancer is a time of high stress, high anxiety, and surprisingly tight schedules. Most people would assume that cancer treatment involved a lot of sitting around and recovering when in fact it is more likely that you will go to multiple specialists per week and be constantly on the run. Those few times that you do have a break, your body is so exhausted that all you can manage to do is sleep. We want our meals to be easily reheat-able and easily stored so that our loved ones can easily grab small bites of food when they have the energy to eat. You should ask your friend with cancer, are there any textures that are hurting their mouth. Another great question to ask is about the severity of dry mouth and mouth sores. Mouth sores can be extremely painful to the point of where there debilitating effects can not only break your spirit but also your ability to get nutritious meals into yourself. If mouth sores are really bad, consider meals that can be eaten at room temperature like a cold soup. Other things you can do are to make sure you use soft textured food and avoid dishes that are overly spicy. Armed with this information, you can make better choices and become a more effective contributor when you help your family and friends that are going through cancer treatments. Remember, when we cook for a loved one who is going through cancer treatments, we are NOT cooking for our preferences. We are cooking for their preferences.